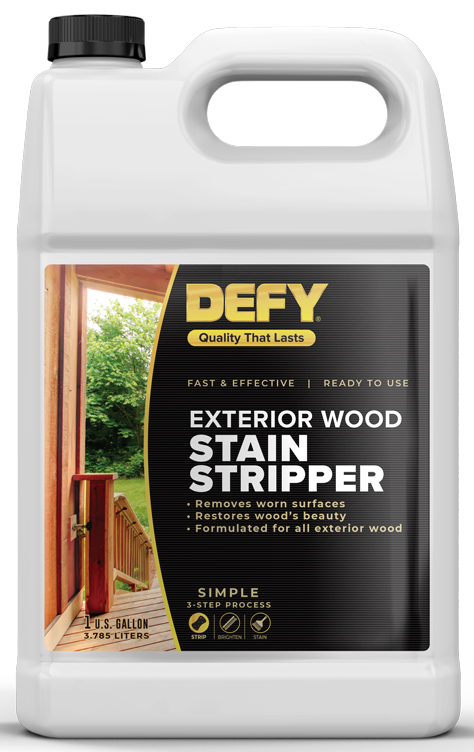 Defy Exterior Wood Stripper is a biodegradable, easy to use deck stain remover that will quickly remove stain wood finishes to restore the natural beauty of wood surfaces. Stains and varnishes are removed along with collected dirt, mold, mildew and mill glaze. 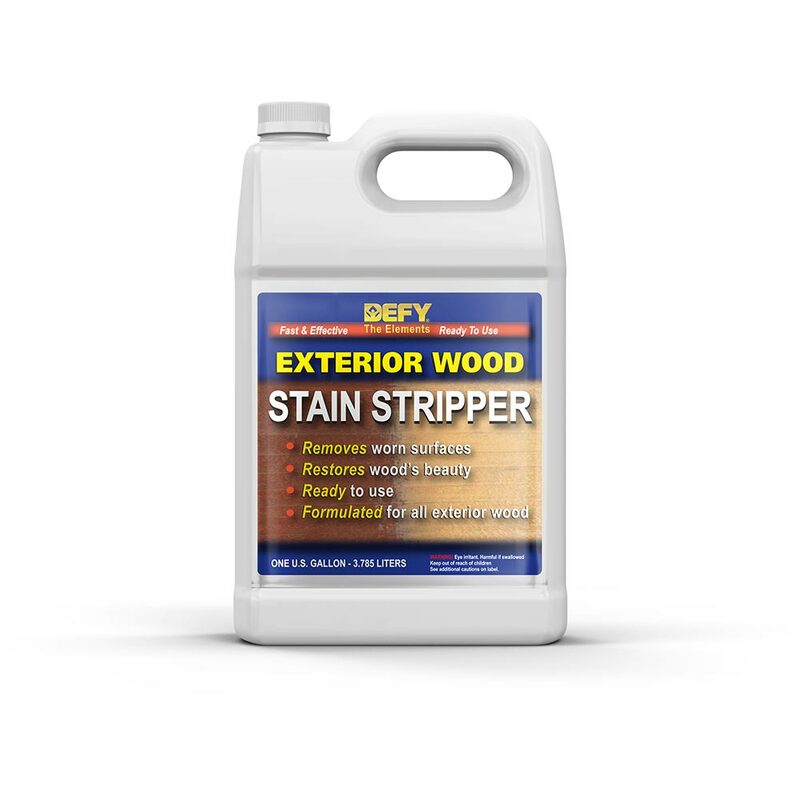 Defy Exterior Wood Stain Stripper will remove most oil and latex based finishes including: clear film-forming varnishes, polyurethanes, solid color and semi-transparent stains. To find out how to remove wood stain with Defy wood stripper, read below. 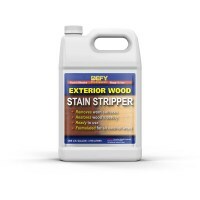 Defy Exterior Wood Stain Stripper will remove weathered solid color stains and varnishes as well as semi-transparent stains that cannot be removed by simply cleaning. If unsure whether the wood needs to be stripped or just cleaned, test a small, inconspicuous area to determine which method will provide the best results before proceeding. Defy wood stripper will cover 100-150 sq. 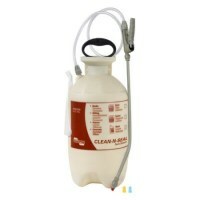 ft. per gallon and is sold in 1 gallon containers. Applying a generous amount of this deck stain remover with a polyester brush, roller or pump-up hand sprayer and then allowing it to sit for 15 minutes will cause the finish to begin to lift and remove stain wood finish from the wood?s surface. After the finish begins to lift, scrub with a stiff bristle brush in the direction of the wood grain. After scrubbing, rinse with large amounts of water in the direction of the wood grain. Using a pressure washer, although not mandatory, will eliminate the need for scrubbing. However, particular care should be taken with a power washer to avoid damaging the wood. After rinsing, you must neutralize and brighten the wood with Defy Wood Brightener immediately. If stubborn areas remain, repeat the application in those areas. Without knowing what the white residue is, it is impossible to say if it will or not. Have a white residue on untreated pressure treated wood that i cleaned with simple green, Tried to remove it with white vinegar. Will a stripper remove? Yes we do ship some products that are allowed to be used in Canada. I am sorry but nothing removes a solid color deck stain effectively. I would remove as much as possible then stain over the top with another solid stain. I'm refinishing a deck which is in poor shape and has an unknown red solid color stain (paint?) on it. I have tried numerous times to strip it with Behr with no luck. I've literally used a half gallon on about 10sqft and can't get the stain to strip even when using a putty knife. I'm hesitant to waste another $20 on a different homestore brand. Any ideas of a product to try? I'm considering using HD-80 as it seems to be the best recommendation on the internet forums. It's not the best, but will I have decent results if I just clean, sand, and stain overtop of the existing? I'm not going for perfection--better would be sufficient until I can afford to rebuild. No, nothing will remove or strip that horrible Synta Restore. Does Defy Exterior Wood Stripper removes synta deck restore ? Which Sikkens is it? The SRD penetrating stain or the shiny varnish Cetol DEK version? If the SRD then the Defy Stain Stripper should work. The Sikkens Cetol DEK cannot be stripped off. It would need to be sanded off. We am starting to strip our deck and need to make the correct choice for stripper and brightener. Our deck has Sikkens currently on it. I read abour HD80, but you state that it is not really for homeowners. What would be a suitable substitute to remove the Sikkens from the deck? You should cover the bushes with a tarp or pre-wet and rinse constantly if any over spray does get on the shrubs. Is any special prep required to protect shrubs surrounding the deck before stripping? I would use the Defy Stain stripper to remove the excess coating. Make sure to neutralize with the Defy Wood Brightener. We've used Defy UV Clear sealer for about 4 years and love it because otherwise we get a lot of algae every spring. (We live in rainy, snowy Syracuse.) We tried to go two years between coats, but found we need to apply it annually to avoid the algae cleanup. Last year we had an unexpected light rain shower shortly after applying the sealer, so perhaps that's what caused extensive peeling of the sealer? It's obvious that the old sealer needs to be removed before resealing. What should we use? Yes this stripper is very effective and should work well on the Cabot ATO. Only issues is if the Cabot was excessively over applied. If so you might need to use the stripper twice. 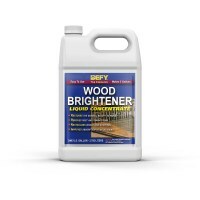 Makes sure to use the Defy Wood Brightener ([url]http://www.opwdecks.com/defy-wood-brightener.htm[/url]) to neutralize after the stripping process. I have a years of Cabot Timber Oil on my deck. Just wondering if this is the "best" product to get back to original wood without having to sand. Any info is greatly appreciated. :-)Best product that I have found out there. Im on my 20th year and to my knowledge the only one in the area refinishing decks. I swear by the product and have tryed almost everyone on the market. Pretty inexpensive in the scheme of it all, but do relize that in any state that receives snow, solid or semitransparent stains only look good for 2 years then they peel or flake off. Probably not as this product is designed for exterior stain removal. Despite me best efforts to explain that the interior stain said "interior" on the can and the exterior said "exterior" on the can, my contractors have put a coat of exterior stain on the interior of the house. The only thing the manufacturer recommends is media blasting... both expensive and time consuming. The stain is "Symphony" water based from Sascho. It is water based, and very dark. Any chance that this will remove one coat? I'd like to try it before I media-blast. The chemical(s) are biodegradable. You should pre wet the plants, rinse thoroughly when done and you should not have any issues.